Ready to see the sights? Each of these scenic trip ideas starts the day in Anchorage, and could have you back in the city in time for dinner. 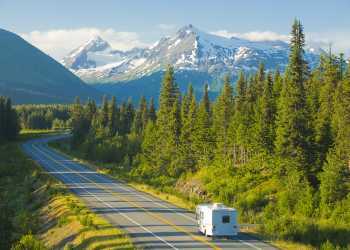 A national scenic byway and widely hailed as one of the most scenic drives in Alaska, the Seward Highway and Alaska Railroad leave Anchorage southbound for the Kenai Peninsula, including the cruise ports of Seward and Whittier. The first 40 miles of the trip parallel Turnagain Arm, home for beluga whale, Dall sheep and many trailheads. At the end of Turnagain Arm countless alpine glaciers hang down from the peaks. There are many accessible glaciers in the Portage area. Cutting through the wide open spaces of the Hillside neighborhood in Anchorage, the route to Glen Alps cuts steeply uphill on Toilsome Road (obviously named by someone walking or biking up). The elevation gain of a Flattop hike may leave walkers winded, but drivers will be breathless too; the road offers one of the best panoramas of Anchorage, with Mount Susitna and even Denali, north America&apos;s tallest mountain, visible on a clear day. And if the view leaves you inspired, the drive ends at Glen Alps trailhead, one of the most popular starting points for hikes in the Chugach. Drive yourself, or catch Flattop Mountain Shuttle and leave the driving to others. The Parks highway connects Anchorage to Denali National Park and beyond, but the views of Denali are often best along the first 100 miles of the Parks Highway. A detour to the mountain town of Talkeetna won&apos;t get you inside the park, but often means better mountain views plus time to explore a storybook row of historic shops, and ample opportunities for jet boating, rafting and flightseeing. Ranches and farms in the Matanuska Valley are ringed by picturesque peaks. The landscape quickly shifts as the road follows Little Susitna River back to Hatcher Pass. Eke through a narrow canyon in the Talkeetna Mountains and up the switchback to a once thriving gold mining operation. The treasure here isn’t just a view. Many of the historic buildings still stand, ready for modern day explorers seeking a little Gold Rush enthusiasm.